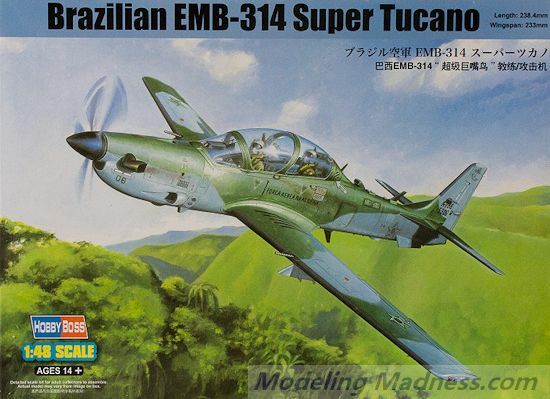 The Embraer EMB 314 Super Tucano, also named ALX or A-29 is a turboprop aircraft designed for light attack, counter insurgency (COIN), close air support, aerial reconnaissance missions in low threat environments, as well as providing pilot training. Designed to operate in high temperature and humidity conditions in extremely rugged terrain, the Super Tucano is highly maneuverable, has a low heat signature, incorporates 4th generation avionics and weapons system to deliver precision guided munitions. It is currently in service with the air forces of Angola, Brazil, Dominican Republic, Colombia, Ecuador, Chile, Burkina Faso, Mauritania and Indonesia, and has been ordered by Senegal and the United States Air Force. Brazil and Colombia have used the Super Tucano in combat operations. This is the first injection molded kit of the Super Tucano in this scale. 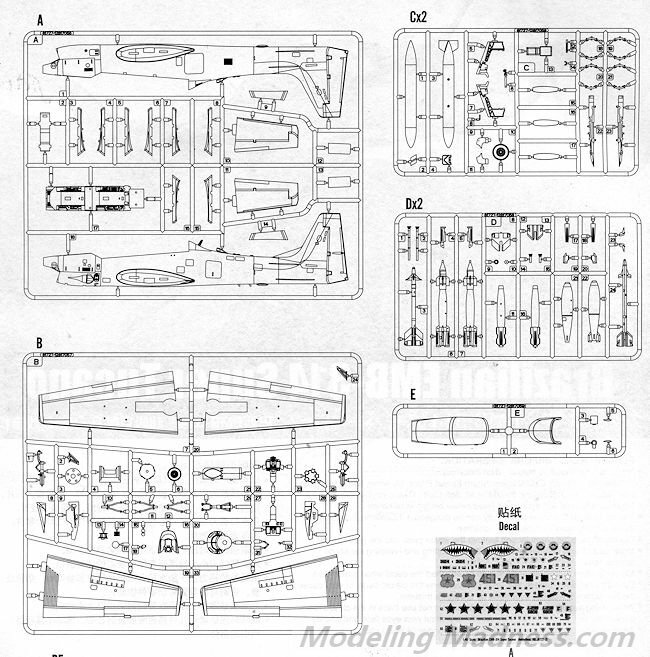 It is very typical of Hobby Boss kits in terms of having superb molding with nicely engraved panel line detailing. The cockpit contains a pair of nicely done bang seats, control sticks, and instrument panels. 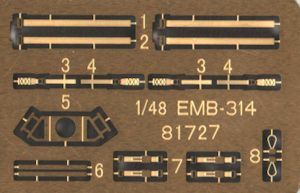 There are decals for the instrument panels and raised detail on the side consoles. The kit offers a photo etch fret and these bits are used for the seat harness and the HUD frame for the front seat. The nose gear well is made of three parts and this fits into the forward fuselage. Though the instructions do not show it, I would install quite a bit of nose weight in this one as there is a lot of airframe aft of the main gear. 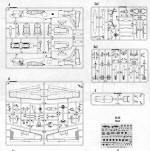 Since the nose section which has the prop assembly is separate, one can wait until the kit is near completion before doing this so you are sure to get enough weight installed. The cockpit is topped with a very clear canopy and windscreen. Both of these have seam lines running down the center of them. Looking at photos in the reference link, this seam is supposed to be there on the canopy and in fact, you may want to accentuate it as it is quite prominent. One does not seem to be on the windscreen so that is one you may wish to remove. For the wings, there is wheel well detail molded into the upper section. Holes for the weapons pylons are already drilled out so those who want a clean wing will need to fill them. Landing gear is nicely molded with separate wheels both on the nose and main gear. Weapons pylons include anti-sway braces for the inner pylons. There are several under wing ordnance options that include fuel tanks, Mk.82 Snakeyes, AIM-9L/P Sidewinders, standard Mk82 slicks and GBU-12 LGBs. A loadout diagram is provided. One thing that may models (and modelers) miss is that on turboprop aircraft, the blades are feathered when the power is off. Hobby Boss got this right and the nicely done five blade prop is designed to be built feathered. Instructions are nicely drawn with Gunze paint references. The full color camo and markings guide provide other paint options. Three sets of markings are provided. 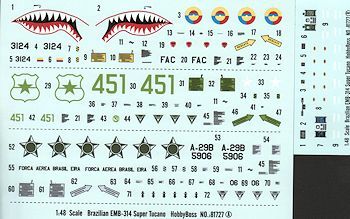 One is the Brazilian box art plane in green over grey (the markings instructions have the wrong upper color shown). In a similar scheme but with the upper color in a dark grey is a Colombian plane with a huge shark mouth. This plane has a solid grey upper wing. Finally, a Chilean plane in a wraparound SEA paint scheme. A nicely done decal sheet is included and all the options are quite fetching, making your choice a difficult one. Not shown is an additional sheet for weapons markings. The decals are nicely printed and should work as well as any aftermarket. I'm the sort of builder who likes things that are a bit off the normal line of things. Kits such as this attract me and that is why I picked it up. If it goes together as well as other Hobby Boss kits, then it should be a beauty when it is done. Seeing as to how many nations are flying this aircraft, I'd be surprised if we don't see some aftermarket markings being made available in the near future.